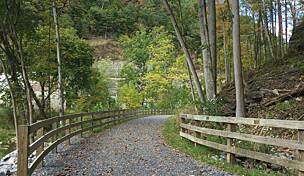 Plan a full day (or two) for your visit to the Western Maryland Rail Trail (WMRT), a 22-mile paved route that will take you through several eras of American history. You can access this trail from many points, but the main trailhead is in the quaint town of Hancock (population 1,750). Stop here for food, drinks, antique shopping, to stay the night or just to wander around the historical downtown, which was once Maryland's frontier and frequently visited by George Washington, among other notables. From the trailhead in Hancock, you can head east or west along the trail, about 10 miles in either direction. Whichever direction you choose, expect to pass fields and wooded groves. 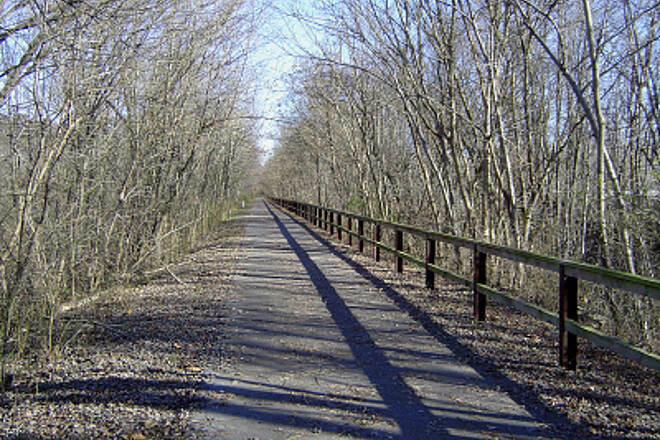 The rail-trail parallels the Chesapeake and Ohio Canal, a 185-mile, unpaved towpath that was used to transport coal from Cumberland, Maryland, to the port of Georgetown in Washington, D.C., from 1828 until 1924. The route's historical sites include the canal's locks and lock houses. 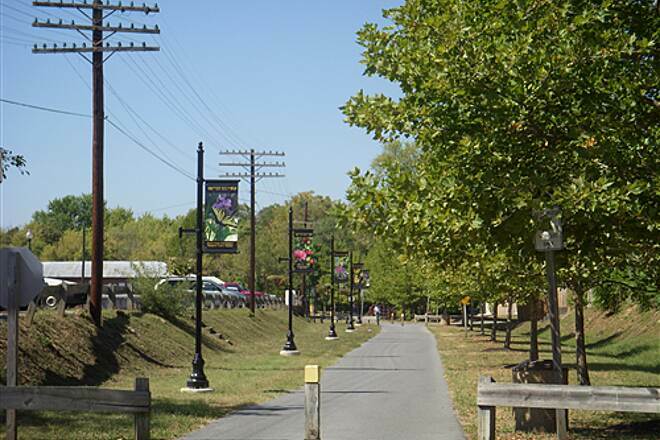 Along the 22 miles of the WMRT, you'll find nine connections between it and the C&O Canal Towpath. (Those connections are marked in the state DNR's map; see link at right.) 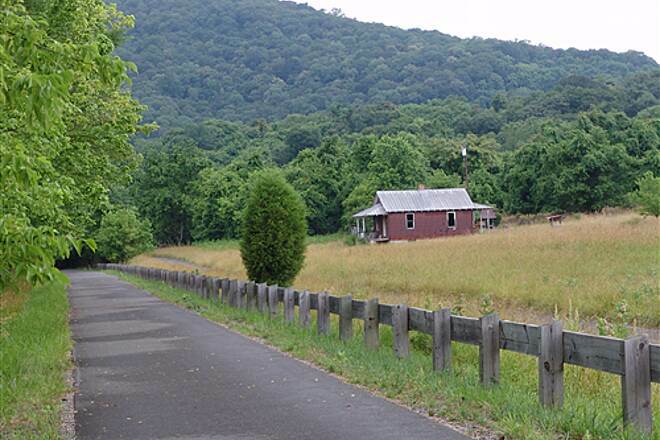 The most important connection for bikers headed east on the C&O Canal Towpath is the one at Ernstville Road. To the east, and just past downtown Hancock, you can buy trailside snacks from Blue Goose Fruit Market & Bakery where, in the 1920s, more than 5,000 surrounding acres were planted with fruit trees. Traveling a little farther, you will find historical markers for Little Pool and Park Head cemeteries. Be on the lookout for deer and wild turkey that are not fazed by the loud traffic nearby, nor are the bears that are occassionally spotted in the area. 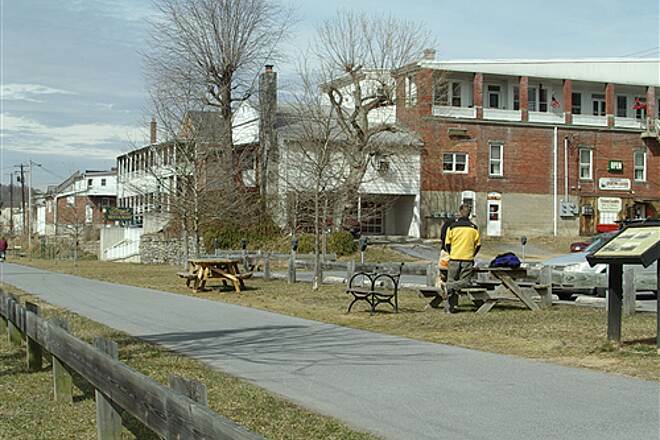 Fort Frederick State Park trailhead: From Interstate 70, take Exit 12 to State Route 56 and head east toward Big Pool. The trail parking lot is across the street from the post office. Hancock trailhead: From I-70, take Exit 3 and travel west on SR 144 for 1.4 miles. There is parking at Hancock Station, just off Main Street. Sideling Hill Wildlife Management Area trailhead: From I-68, take Exit 77 and head south on Woodmont Road, which will intersect with the trail at Pearre Road. Parking is available. 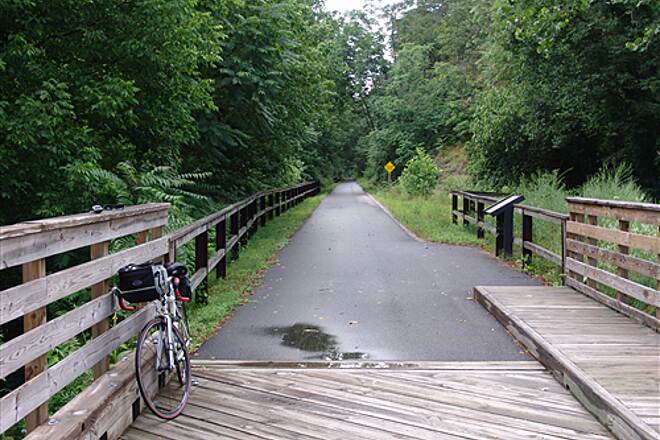 One of Maryland's top rail trails for scenery and the amenities in Hancock. However the asphalt surface is becoming a problem due to tree roots. The bumps are frequent and painful, especially on a road bike. Several riders on hybrids also complained. Trail managers need to get on top of this before bikers begin to abandon the trail. Even if repaving is not possible, a milling machine can help smooth out the bumps. One of our favorites. About 3 miles on west end closed because of mud slides. Rest of trail good, but tree roots are starting to make some sections bumpy. clean, paved trail with a little bit of history. I rode from the trail head in Big Pool, MD to the fruit market about 8 miles away on Thursday, 4/26/18. It was a sunny day, 65°. I rode through a sparsely populated area and then paralleled the C&O canal for the rest of the way. The foliage is not in bloom yet so it is not so much a joyous experience as a healthy ride in cool weather. 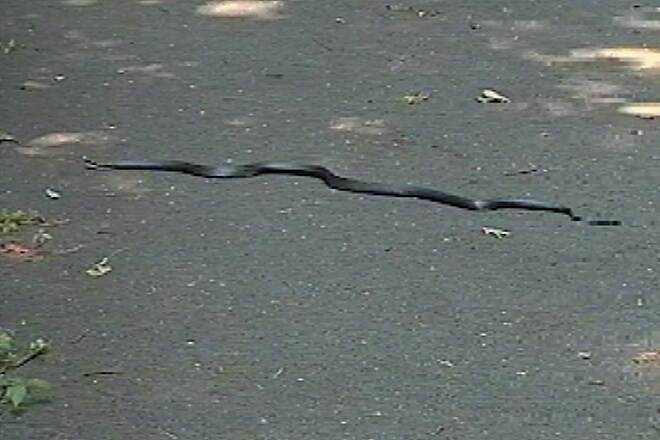 There was a road biker taking advantage of the paved asphalt surface riding at a fast clip. There were also a few other riders on comfort bikes enjoying the scenery like myself. I would recommend this trail to anyone who is tired of crushed gravel surface rail trails but still want that rail-trail feel. This trail parallels I-70 so it is a bit noisy. For this reason I give it only three stars. We love this trail and wouldn't mind riding it again someday. We had to travel to get to it so we stayed at a hotel in Hancock, MD so that we could ride the western half one day and the eastern half the next. I can't say I would recommend the America's Best Value Inn. We travel with a camper now, thank goodness. But the trail was just lovely and I recommend it. Just far enough from the cities! This wonderful trail is just far enough from the heavily populated Baltimore/Washington area that it is never crowded. Even on "busy" weekends you'll pass just a few other friendly folks who enjoy biking enough to make the trek to Hancock. For us "weird" recumbent trike riders there are a few teeth rattling tree roots pushing up the asphalt in places. Regular bikes with even modest suspension or fat tires will barely notice them. Enjoy this wonderful gem of a trail! This is an excellent trail. Smooth pavement. Places to stop along the way for snacks or restaurants. Good scene scenery along the c&o canal. and can see the river in places. But the eastern end is next to highway 70 is is pretty noisy. Great smooth trail that is well kept and full of wonderful scenery. Highly recommended. This is a 22 mile smooth asphalt trail that is great for Road bikes, and gives a 44 mile roundtrip run. I managed over 500 miles on this trail during the month of June 2017 starting at Big Pond and riding the length of the trail each time. 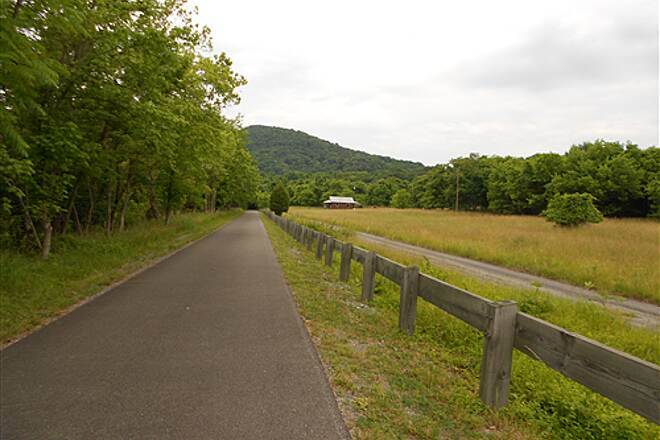 I averaged over 17 miles an hour so it is a great trail for just riding, it is pretty quiet especially during the week and is well shaded for summer use. Highly recommend and worth the drive to go an enjoy. My wife has had two knee replacements. We needed a place to ride that she could maneuver. So after donning her yellow recumbent trike, my problem now is keeping up with her. We also like the extras here. From the cement mill, C&O nearby to the cool cave... we love it! Beautiful Day! Started about 10:30am and rode from the Hancock parking lot just East of Hancock. It was cloudy and 75 degrees. Rode to the end of the trail and back ~ 25 miles in under 2 hours. This trail is very flat. We met a trail monitor (CPA) and he gave us many good tips. Then we grabbed more food at our car and continued 9.5 miles or so to Mile 0. It was sunny by then and the only place to buy water is in Hancock. There is no water on the trail. Completed the 18.5 mile loop in about 90 minutes. Saw two emergency vehicles coming up the trail towards us with bikes on top - hope everyone is ok. The is a super flat and nice trail. They only thing I would recommend is to remove the larger sticks since there were some on the trail. Otherwise very friendly and nice people and great day. We also stopped at the way out at the Blue Goose (by car) for snacks. Pretty touristy. This is a beautiful trail and a pleasant bike ride. I’ve ridden several bike trails and paths and this is by far my favorite. There are a few tree root bumps in a few spots that are in need of grinding down at this point, but nothing serious, just annoying. You’ll probably see an occasional rabbit, squirrel or deer along the way. The shade makes it a little more comfortable in the summer. Buddy Lou’s in Hancock is great stop for lunch, as are other restaurants there. 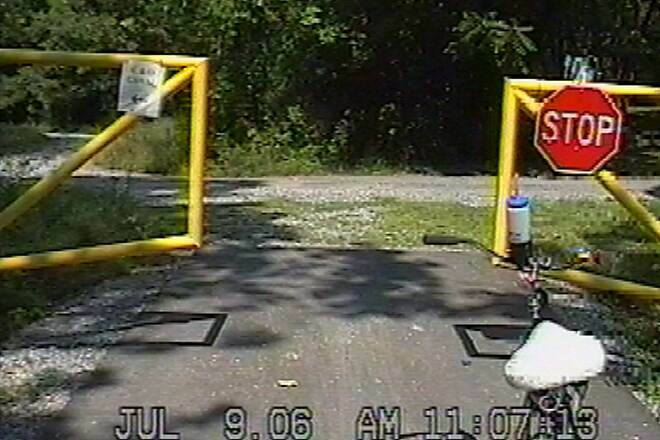 Bikers may encounter an occasional pedestrian (runner) that does not want to follow the rules. ALL users of the trail are supposed to stay to the right. DoNR says stay to the right. That’s true for every trail I’ve hiked on or ridden on, including the C&O. BUT, some runners feel that because pedestrians have the right of way they can run in any direction they want. It may be safer to run on the left facing traffic on the street but not so on the trail. Be courteous (and safe), stay to the right. This trail is about 3 hours south of where we live, but the promise of 70 degree temperatures after 3 months of winter was just too much to pass up. So we packed up and hit the road early on a Saturday morning to drive down and check it out. We were not disappointed. The asphalt surface, shallow incline and mild temperature made for a very enjoyable ride and our many thanks go out to those responsible for the creation and maintenance of this trail. This is a very nice trail. Just a quick heads up regarding parking. We started on the east end of the trail and by the time we finished our ride the parking lot was completely full with vehicles overflowing onto the grass. We started at the beginning of the trail at Sideling Hill Wildlife Mgmt area. Quite a backwoods drive to find the trailhead but worth the trip. Trail was very well maintained. 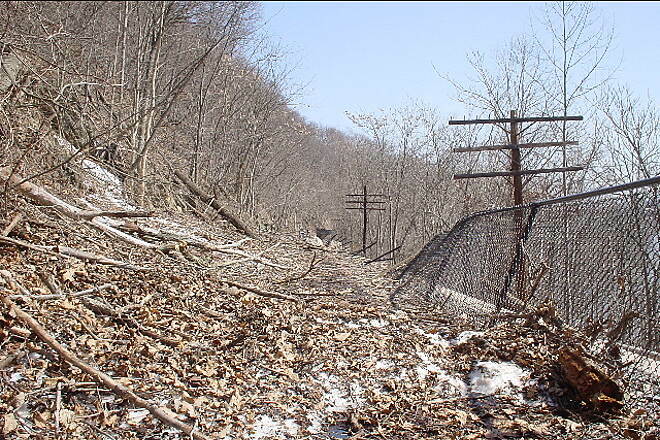 Could see Tow path trail running parallel and also old telegraph lines still standing. Road to Hancock, MD where there are many quaint shops and nice places to sit and relax and have a picnic or find a hometown restaurant to refuel. Began the ride at the Big Pool trailhead and rode to the end. Found the trail to be suprisingly flat and straight. Some areas were almost 2 miles long without a curve. It was a cloudy cool early Oct. morning. Saw deer, lots of squirrels and a flock of turkeys. Lots of tree roots have raised the pavement, especially near mm.6-8, 17-18, and around mm.20. I had taken my hand off the left handlebar to flex it and was almost thrown when riding over one of them. So be careful, keep both hands on the handlebar. Some of the cracks have been painted to improve visibility, but not all. One other word of caution: watch the leaves especially if the trail is wet or even damp; there were many fallen leaves but they were dry on this particular day. This is a great trail! So easy to do and not many people on it even on a beautiful day. Tried to do a bit of the C & O trail next to it, but I was not steady enough to stay in the small worn sections. 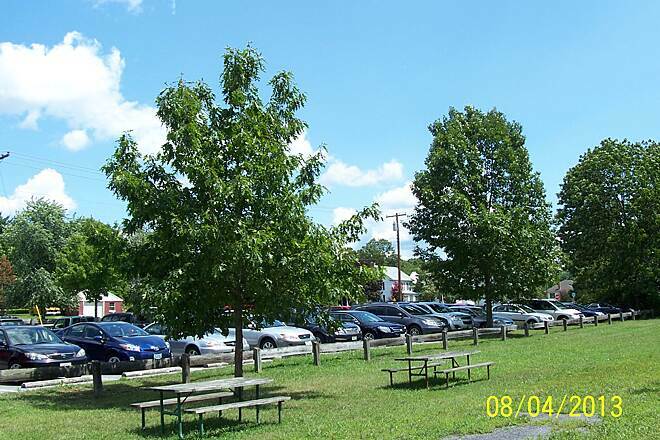 We stayed at the Woy Bridge Campground in Everett, Pa which was less than an easy 30 minute ride to Hancock where there was ample parking. We spent most of a week at the quiet little campground and took day trips to various biking trails. Really enjoyed ourselves. Did a round trip of the WMRT starting in Hancock going east to mile 0 and then back out to mile 22 and return. With the heat today I started 20 minutes before sunrise, and saw quite a few deer, rabbits, squirrels and a turkey. Made the trip in 3:09 not to bad for an old man. The trail is in good shape and I am looking forward to when the extension is complete. 22 miles of shaded, flat and gorgeous trail! Great for beginners and experts alike. We picked up the trail about 4 miles south of Little Orleans. This is virtually the beginning of the trail. It's accessed near a parking lot with a gate and dilapidated building. We had been riding the C&O Canal and wanted to make up some time. It's also quicker if it's raining. It was easier to coast the pavement in the rain than the canal trail. It runs parallel to the C&O. It passes through the town of Hancock. The end of it and its connection back to the C&O is well-marked. It's not particularly scenic so don't ride it for that purpose. I drove over 2.5 hours to the Big Pool parking area from Pennsylvania. Easy to find and the paved trail starts at this location. I read a previous review and took the advice to ride before the leaves were on the trees. The views are pretty and the trail is in good shape with the exception of a few tree roots protruding through. Even with the beautiful weather there weren't too many people on the trail. The asphalt is wide enough to ride side by side. When we got to the end of the trail we decided to continue and hop on the C&O trail. It's gravel and grass not too shabby either. We rode it for 12 miles until we got back to Hancock then rode the WMRT back to the parking area. I recommend this trail and easily rode almost 46 miles today! Great autumn ride only 1h30m from columbia md. This is a wonderful way to get in a nice long weekend ride. Cycled from BigPool to western end and back on a chilly but sunny day in early November 2015. Even with the leaves down, there is much time spent in the shade so it remained chilly but was comfortable (about 10 degrees below forecast high) - low sun angle and abundant trees. Stopped in Hancock down by the river for a snack and also stopped at western end, again by the river. Beautiful river vistas and very peaceful. My odometer read 45.5 but I did ride down to the river and back. I wanted to test ride the new bike out on the c&o without a full commitment, so I liked the idea that I could ride the canal for a few miles and then hop back on the rail trail (which I did at lock 55). One issue with the rail trail is the "root bumps". The western 12 or so miles is chock full of these bumps which can be an issue if you pick up some speed on the otherwise nice surface. I expect this will be a significant long-term maintenance issue. Saw several pileated woodpeckers flying in the understory which was a pleasure. Bunch of squirrels, a few deer crossing the trail and bluejays. Hancock has a cycle shop right on the trail and good prices (relative to Columbia anyways). The parking lot at the eastern end was only half full - I was concerned since it's not a big lot and figured since it was such a nice day it would be full by the time I got there. Could always park on grass I suppose. Also, Fort Frederick is close by so my alternate was to go the Fort parking lot and then take the C&O up to the first join point on the rail trail - about 1.5 miles in. I have done over 200 Rails2Trails and how anybody can say this trail is BORING must have had a very bad day. I love all kinds of trails and after being on the C&O Canal trail this trail was like being on a super highway. It has it all a great surface, restrooms, and great over looks. There are over 45 reviews and this person is the only one that said it was BORING. I biked out to the east end of the WMRT switched over to the C&O Canal towpath and with a slight detour ended up at Ft. Frederick, a historic park which is quite interesting. On the way back I had lunch at the Park N' Dine restaurant which is next to the trail and had a fantastic crab cake. I finished up at the Riverrun B&B which is conveniently located beside the Rail Trail and had some tea. 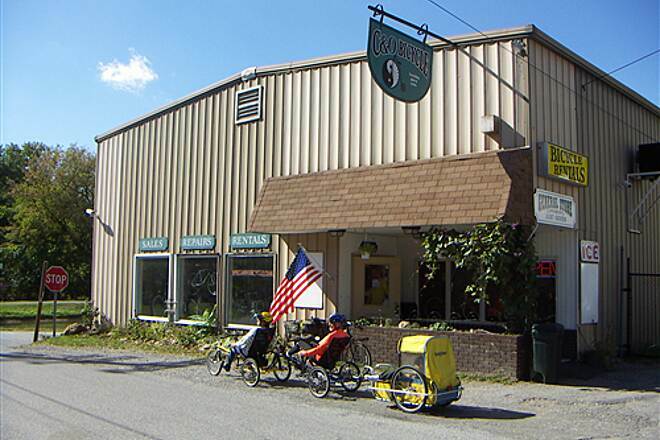 There is also an excellent bike shop called the C&O Bicycle Shop in Hancock where you can rent bikes and get snacks. I ride the WMRT a lot and find lots to see. On my last trip I found some ripe Paw Paw fruits to eat. Earlier in the summer I had some nice raspberries which were growing on the trail. I have seen: foxes, turkeys, opossums, bald eagles, owls, indigo buntings, a fence lizard, dung beetles, turtles, snakes, lithospermum flowers, larkspurs, wood frogs, spotted salamanders and lots more. 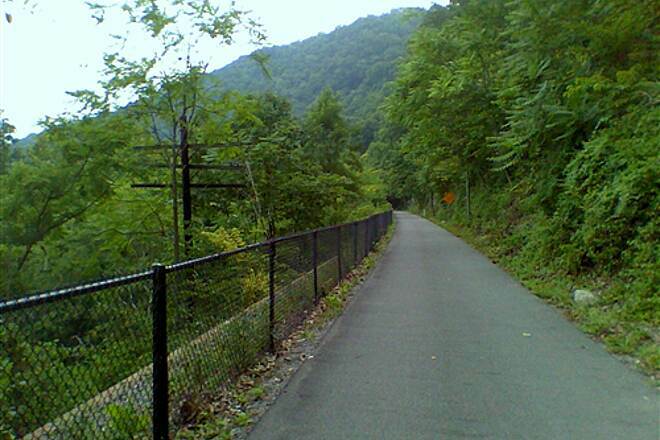 Having now ridden the Western Maryland Rail trail end to end, I have the following thoughts and advice. 1. It is nearly flat with long straights that result in boring ride. 2. The only time you could possibly enjoy the view is after the leaves have fallen or before they have come out. Otherwise you riding through a tunnel of overhanging trees for 90 percent of this Trail. This could be rectified if the Park Service which manages the parallel C&O canal trail would allow the State of Maryland to remove some trees. 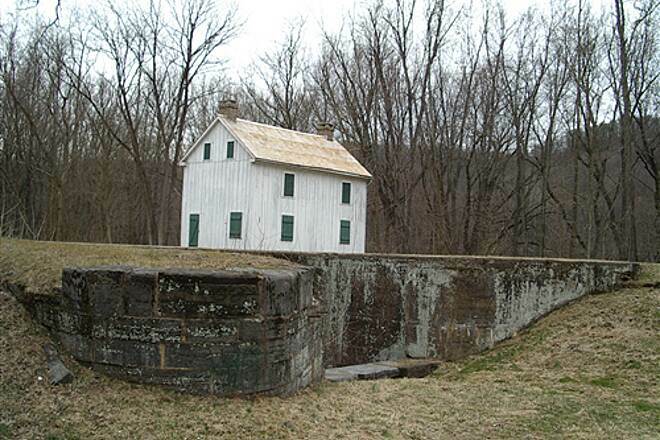 Which when you think about it - likely had been largely cut down during the time the C&O canal was operating. So if the Park Service's mission is to preserve history and provide for the recreational enjoyment of Americans they should allow for strategically placed openings to provide opening to at least see the river and surrounding hills. Just as they are cutting many of the trees down at Gettysburg, they should allow some to be cut here too. 3. Like most trails this age with trees growing on the sides, this trail is beginning to have a fair number on root caused bumps across the trail making for several areas of really annoying lumps and bumps. 4. Maybe it is just that time of year but the squirrels seem to be suicidal. In the 44 miles I rode I had to have had six near misses with squirrels racing across the trail between my wheels. 5. Compared to other rail to trails I have ridden in five other states I would say it is a nice trail but not a really nice trail. It was disheartening to see so many older riders riding without helmets. But at least they are riding. The path is paved and shady most of the time. Stop in at Blue Goose for great trail snacks -- fresh peaches, wonderful selection of wine, cheese and craft beers. Also the best pie selection on the planet. BUT THE BEST is Buddy Lou's Eats and Antiques. It is funky and eclectic. 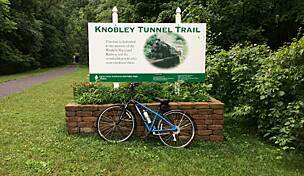 Located right on the trail where you can dump in your kayak or inter-tube and you have a choice of the paved Western Rail Trail or hoping on the C&O. Buddy Lou's loves the bike crowd and has amazing food and drinks. The decorating is artsy and country at the same time. Diane is the smart, talented and beautiful owner. This is part of what makes this trail wonderful. Rode this trail again in September, 2014. Scenery is spectacular, lots of wildlife. The portion west of Hancock is the most remote and more quiet. Great new place to eat in Hancock: Bobby Lou's Eats and Antiques. I heard this was a nice trail for biking and I was not disappointed! 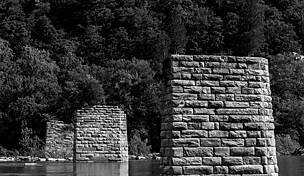 Lots of history along the trail with great views of WV and the Potomac too. As you travel through changing scenery and appear to change elevation, the trail still feels mostly flat. It parallels the C&O and if desired you can switch back and forth or go up out one and back the other - but with the WMRT why bother roughing it on the C&O! Parking in Hancock along the midpoint was no problem - there is a park and ride lot as well as a town park. However, as another reviewer noted - do plan ahead for bathroom and rest breaks. 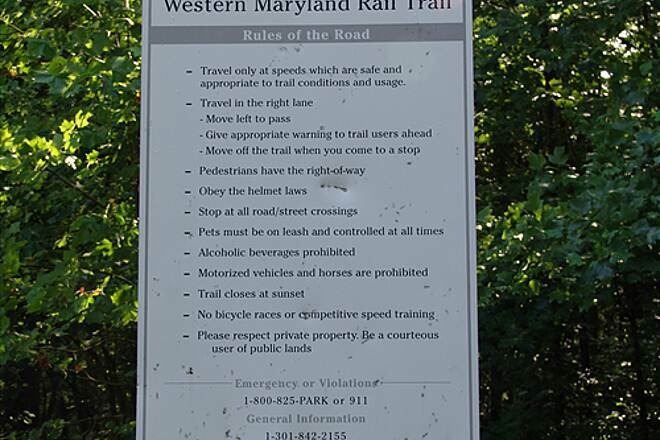 There is also a map available on their website www.westernmarylandrailtrail.org. On our way back from Virginia, the Mrs. and I parked the truck in Hancock, MD and struck out east on the Western Maryland Rail Trail. With it being a rather rainy day (6/21/2014) we opted for the Western Maryland instead of the C&O as the WMRT is paved. After reaching the eastern terminus, we headed back west, and decided to go all the way to the western terminus. 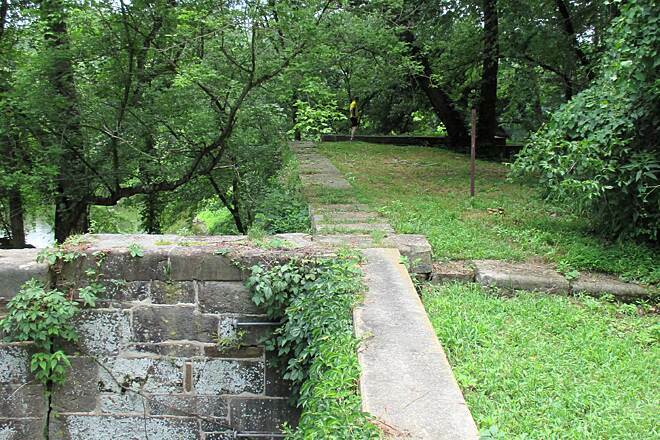 As the WMRT parallels the C&O towpath, you can get a good look at some of the old aqueducts, locks, and dams. There's also an old siding/trestle just east of Hancock, plus the Round Top Cement kiln and sand works, and even some old abandoned houses to the west of Hancock. The surface is flat and fast. I'm looking forward to the westward extension to the old tunnel! Make sure you have used your deet, as there are a ton of mosquitos, especially on the section west of Hancock. Great ride, great trail, even in the rain. This was my first 10+ mile ride, what a great trail! Did the western half, starting in Hancock, total ride was 23 miles. With the tress so filled in the views of the Potomac were limited but there were a few great views. The trailwas heavily shaded which was great for a warm day. As others have said, stopping at weavers is a great idea, small hometown feel, great food and desserts. There is a new big restaurant that's opening right St the parking lot at Hancock station, looks like a very cool place, has a huge deck for outside dining. All in all, What is a must ride. We drove to Hancock and rode east. Wonderful paved trail, saw deer on the trail, and turtles. Rode back on the C&O Canal trail. It's rugged, but felt somewhat downhill, nice views of the Potomac. Was nice to come back on a different trail. Will be back to ride the western half soon. Yesterday was the first time for me riding the WMRT and I was very impressed with the condition of the trail even at this time of year. The leaves being off the trees provided many awesome views of the Potomac River as well as the trains that travel along side the river on the WV side. The winter scenery also provided me the opportunity to see many sightings of deer as well as an owl, bald eagle, ducks, and many fox squirrels. I was lucky to get pictures of all except the bald eagle. 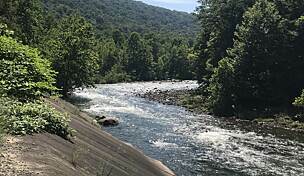 I enjoyed a quick stop at loch 55 of the C&O for lunch and the fantastic view. The temperature was 31 degrees when I started the ride from Hancock heading West and ended up being 46 when completed. I am sure that this was the reason that I did not see a single person until I was on mile 18 on the return trip. I felt like I was on my own personal trail! I could tell that the other seasons would not have the views that today provided but the riding was awesome and very relaxing. This was a very flat trail that all levels of riders can enjoy. I will be back and I highly recommend the winter ride!! I am a newbie to biking, slowly working my way up to longer distances over the past 4 weeks. This trail is by far the best ride yet with lovely scenery, slow grades, and not a lot of traffic. My husband and I started at the Big Pool end and rode 12 miles out and back for a 24 mile ride. The trail is well maintained, no heavy traffic street crossings, and we were able to ride side by side a lot of the way. Will definitely make this a frequent ride. I ride it end to end a few times each year. I always recommend it to beginners as it is easy to ride and you can get on at several points to make the ride as short or as long as they like. The pavement makes it a great place when it is wet since you have no mud to deal with. We have done this trail twice and have had a great time both times. 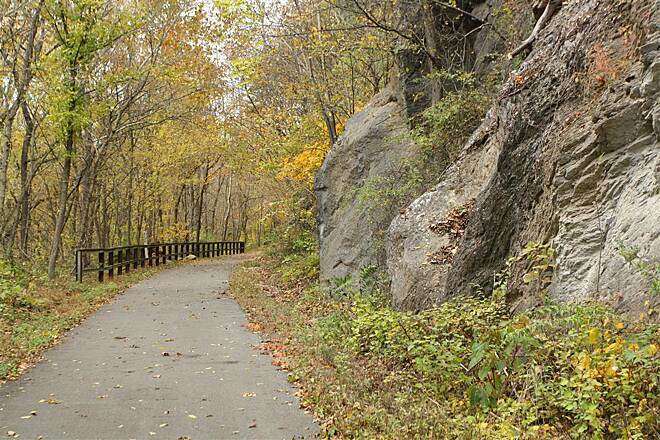 The trail is well maintained and the view of the Potomac is nice. I am looking forward to doing this in the fall when the leaves are down as I imagine we will see more of the river. Consider stopping in Hancock for some raspberry cookies at Weaver's Bakery--YUMMY! We did an out an back--44 miles, so the cookies were good fuel! Biked the western part of the trail last week and had a great time. 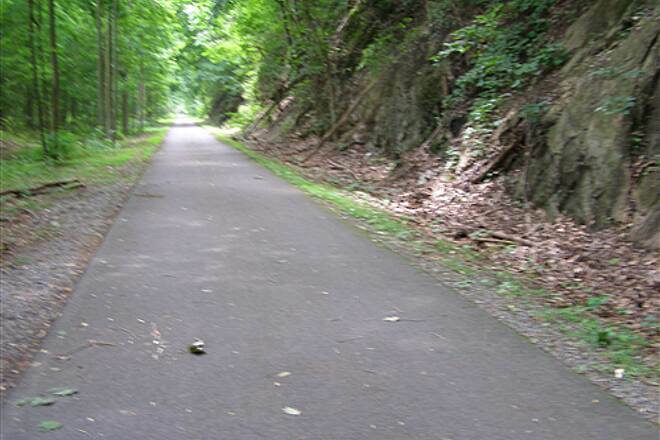 The trail is nicely maintained the entire length with access to the C&O canal in places. Highly recommend this trail for anyone who wants a nice easy ride. 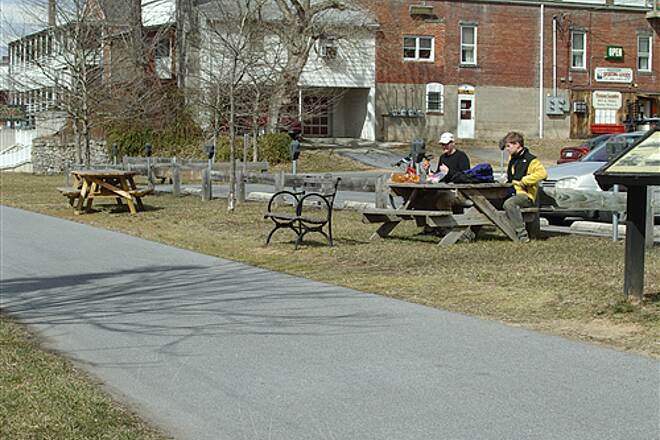 After visiting Fort Frederick, we joined the trail and cycled to its northern terminus. Although the towpath was often in sight, the experience was significantly different. First, the wildlife viewing is much better: lots of wild turkeys and deer. Second, numerous interpretive signs provide an excellent insight into the corridor's early economy - something which you don't appreciate as much in the "cocooned" confines of the towpath. Although one is tempted to speed along the smooth surface of the trail, you will get a much better experience and depth of understanding by taking your time. This is one of the finest rail trails I have ever cycled. This trail parallels the C&O Canal towpath for almost it's whole length (in fact, you can see the towpath much of the time just on the other side of the canal). 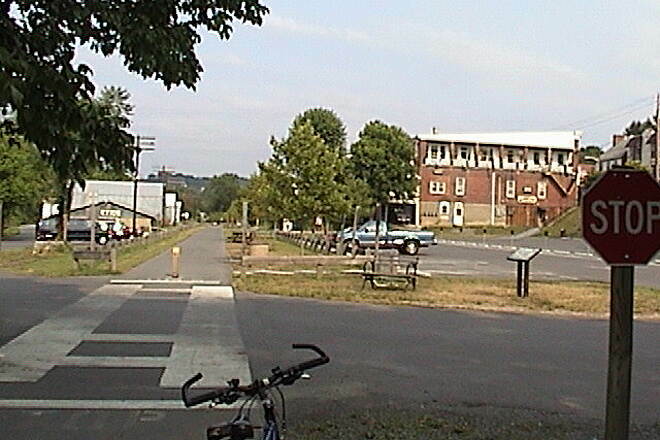 The first time I rode the C&O, I rode the towpath right past this trail because I didn't really know about it. 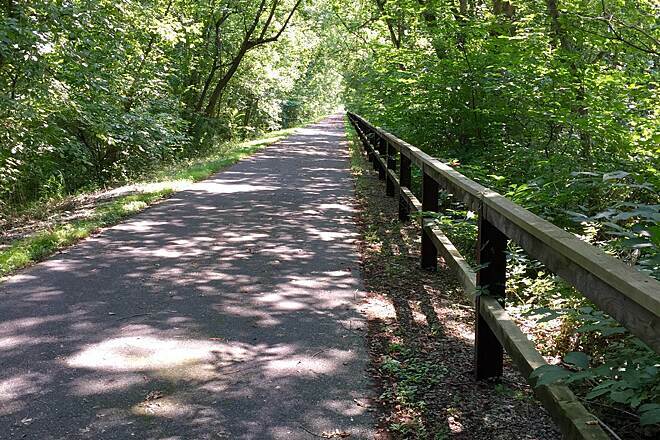 The second time I rode the C&O, I used this trail to bypass about 20 miles of it, and it was a welcome relief, as I had been riding a heavily loaded road-touring bike on the somewhat rough towpath. Comparatively, the paved Western Maryland Rail Trail is super fast and smooth, and just as scenic for most of it's length. There is a several-mile-long section of the rail trail that runs right next to US Route 40, so it's a bit noisier than the towpath. 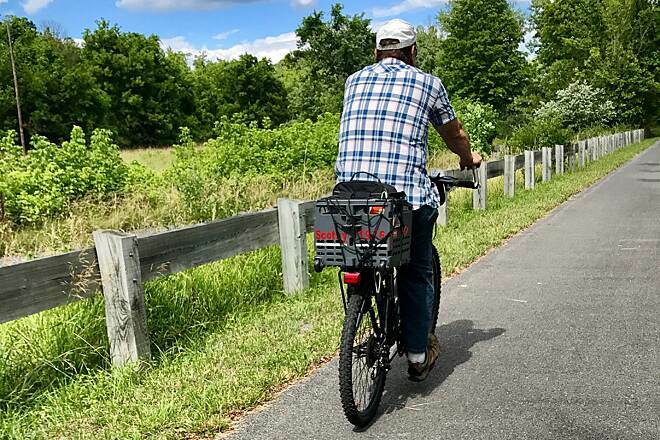 Also, there are many places where it is easy to cross back and forth between the rail trail and the towpath, so you can ride the rail trail without having to bypass the camping areas along the towpath. I highly recommend stopping at Weaver's Restaurant and Bakery in Hancock. They have good food and epic deserts. We did this trail in 2 parts over this weekend. We started in Hancock, which is central on the trail, rode the western 1/2 on Saturday and the eastern 1/2 on Sunday. This is a really beautiful trail. It's flat, so be prepared to pedal non-stop the entire distance. It is all asphalt, meticulously maintained and clean. It runs parallel to the C&O Canal Historic Towpath and there are many points where you can transition from one to the other if you wish. You'll see historical remnants all along the way. It was uncrowded and everyone we encountered was courteous and friendly. We enjoyed it immensely. The town of Hancock is all about this trail and the cyclists that come to ride it. As a waitress in one of the diners where we ate told me, sadly, "it's all we have left". Hancock is a lovely little town with great charm and nice people, but has seen an economic downturn in recent years, losing their industry and their apple orchards, so they are very happy to have the business that cyclists bring to the area, and treat them accordingly. We stayed on Saturday night at the America's Best Value Inn. We were disappointed in a lot of respects. It was run down, not very clean, there were many things in the room that were broken, no blankets, and for what it was we felt it was very overpriced. The sign outside says "rooms starting at $45" but we paid $78 for a basic room with 1 bed. The only thing I will say to recommend it is that they are extremely friendly to cyclists and don't seem to bat an eye if you want to take your bikes into the room with you. As a matter of a fact, most of the occupants seemed to be cyclists from the towpath. The pulled in in droves around dinner time. The Park and Dine is a nice place for breakfast, extremely reasonable and they filled all our water bottles with ice cold water. We plan to go back again before the season is over and do it again, all of it in a day this time. Well worth the drive. We rode this trail on 9/6/10. We started at the Hancock Station and rode to the northern end of the WMRT, then came back on the C&O canal trail up to Fort Frederick, returning to Hancock on the WMRT. WMRT was nice smooth asphalt and there were a lot of people on it (maybe because it was Labor Day). Not a real scenic ride. C&O Canal was crushed limestone/hard packed dirt, but pretty big stones in some places. Not much traffic on the C&O compared to the WMRT. Very scenic ride--snakes, turtles, deer, river, big and little ponds--and much more shade than the WMRT. 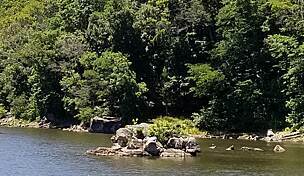 Lots of places to camp along the C&O for people wanting to do a longer trip. We opted to spend the night in Hancock. Stayed at the Super 8. Nothing fancy and a pretty old hotel, but very biker friendly. Decent breakfast. Inexpensive. Weaver's Restaurant has a variety of really good food and awesome baked goods! C&O Bike Shop was very accommodating and friendly (even open until 6 on Labor Day!). May 29, 2010 this rail trail is AWESOME! this is my second time biking in the past 25 years and I have to say that this trail is quite stunning and very well kept. I started in Hancock, MD and went west and came back. this was an easy ride because it is all paved and surprisingly enough, quite busy for memorial day weekend. Everyone I met out on the trail was friendly. I definitely recommend this trail for anyone who likes a leisurely ride to those who are training for speed. earlier becuse this was such a pleasure to go on a straight trail with no mud or pot holes to worry about. Hopefully they will get approval to finish the remaining part of the trail. 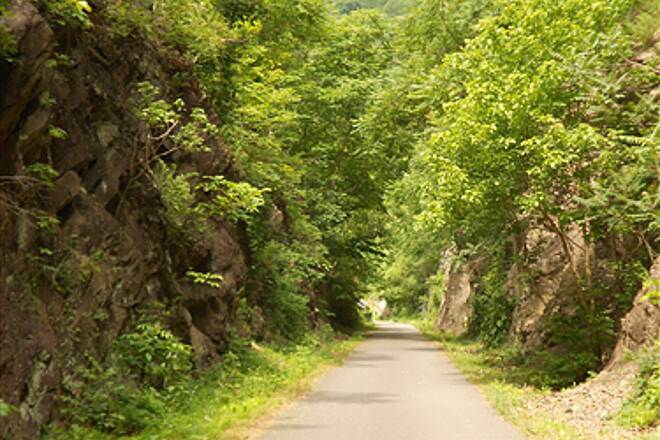 The paved Western Maryland Rail Trail is a great trail for riders of all levels. Hancock, Maryland sits in the middle of the trail. Hancock offers restaurants, a couple of motels, and a good bike shop. 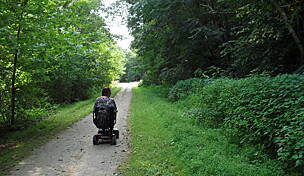 The western half of the trail, west of Hancock, is scenic and quiet. The eastern half lies close to an Interstate and gets road noise, but it is also enjoyable. The WMRT closely parallels the C&O Canal towpath, and there are a number of spots where you can switch between the WMRT and the C&O. The C&O requires a hybrid or mountain bike, not a road bike. I usually ride west from Hancock on the C&O in order to see the historic canal structures and the Potomac River and then ride back on the WMRT to take advantage of the smooth pavement and the WMRT's equally good scenery. The WMRT would be fantastic for a person in a motorized wheelchair. i rode about 3 1/2 miles (7 miles total) of the western part of this trail starting in Hancock, MD. 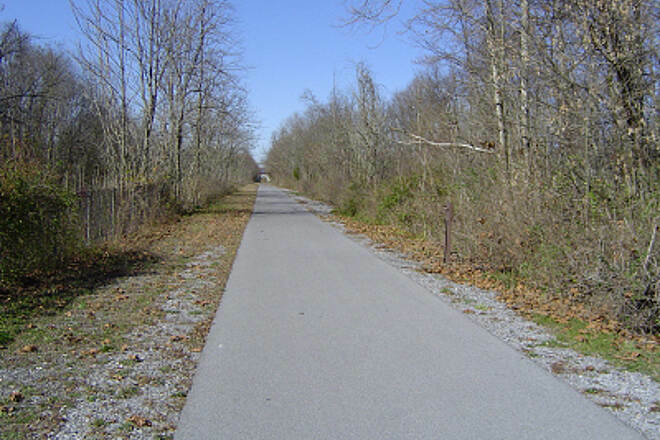 This is a great trail if you are just starting to bike...it is flat..the asphalt makes it for a great, comfortable ride, and the scenery if great!! i cant wait to get out there again!! We did the western half of the trail -- from Hancock to Pearre -- last week and enjoyed it as much as the other half that we did two weeks ago. This segment is also as beautiful and peaceful. It was a smooth enjoyable ride -- and easy for us Hase Pino tandem riders. WMRT is a great trail that is almost flat -- at least the 10-mile portion that we did from Big Pool (the eastern end) to Hancock (approximately the mid-point). We very much enjoyed the ride on our Hase Pino tandem on a beautiful fall day (last week of September). Unlike earlier reports which are from about a decade ago, we found that in 2009 it is well shaded for the most part. 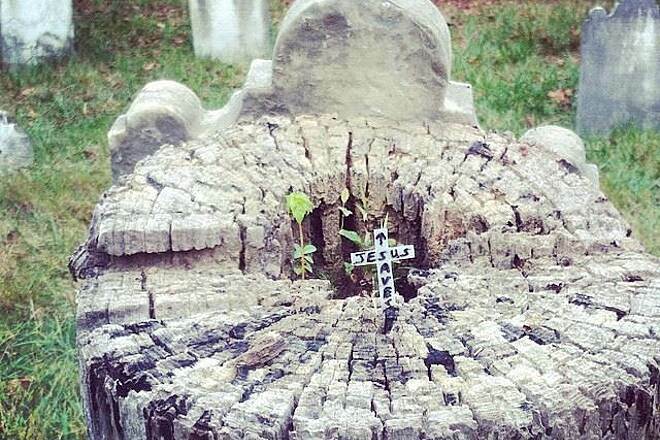 It seems to have been maintained very well too. Also unlike some other riders we were not bothered by the I-70 noise. It was a most enjoyable ride and we would like to do the remaining 12-mile portion sometime later this fall. I recently visited the wmrt. I found this to be a great trail. I started at Big Poole and peddeled the entire length. I found this trail to be flat and very easy peddeling. The scenery on the western part of the trail was great. I hope to visit again sometime in the fall. This past spring break, my family and I spent our time at Happy Hills Campground near Hancock, MD. As we had heard that there was a path from the campground directly to the WMRT, we decided to hike down to see how the path was. With the recent rain, I'm glad we decided to hike down the 3/4 mile instead of taking our bikes down; it was rough. If you have street bikes I wouldn't advise riding them, but you can always walk them down to the WMRT. If you are like us and have cruiser bikes (or mountain bikes) it's a decent path. The first day on the trail we decided to rack the bikes onto our vehicle and drive the 5+ miles into downtown Hancock. After parking at the adjacent lot, we unloaded our bikes and proceeded to take our first "family" outing this year on our bikes. What a great trail. As for our bikes, we have 2 tandems; a 2008 21-speed Pacific Duallie and 1949 Western Flyer (originally single speed but recently upgraded with a Shimano Hub 3-speed). We are really looking forward to returning to the WMRT throughout the year so that we can see more of the trail. Our hopes are to be able to go the entire distance someday, once we get in better shape. Thank you very much for such a great trail! 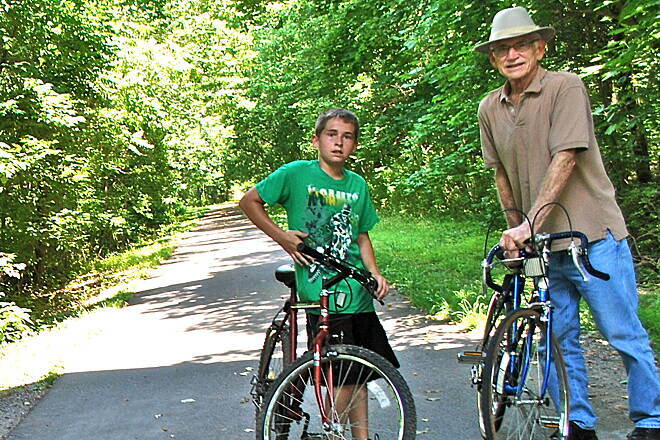 My father and I have biked the length of the trail a number of times. We wait (endlessly) for the start of the "stage IV" of the trail. What's the hold-up? I've talked with many of the riders, walkers, hikers, and even the handicapped users of the WMRT- thay all ask the same thing- when will they start building again? 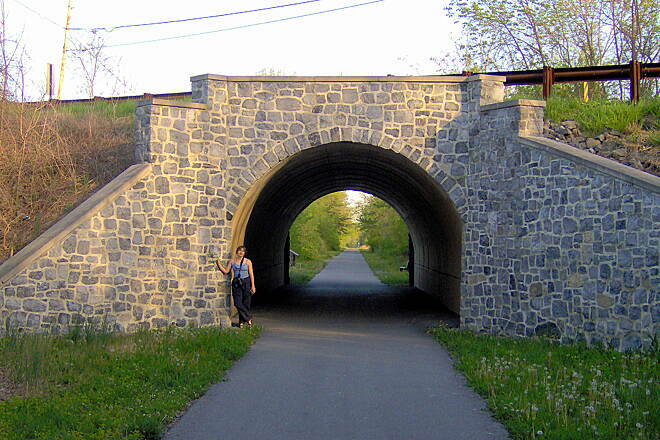 The last I heard (back in 2006) there was at least 2.6 million dollars allocated for the trail extension (of a proposed 5 million dollar tag- including the indigo tunnel, which would be an awsome addition to the trail) I keep researching public records concerning this, but have come up zip. Even my friends at DNR know nothing. How 'bout an update? Anyone? We biked from the Happy Hills campground at about mile 15. Happy Hills campground claims to have an entrance to the WMRT, but it’s a mile of rough trail to the WMRT and horrible for road bikes. The WMRT is a great bike trail and in very good condition. We attempted geocaching while riding, but the geocaching was difficult and detracted from the enjoyment of the bike ride. 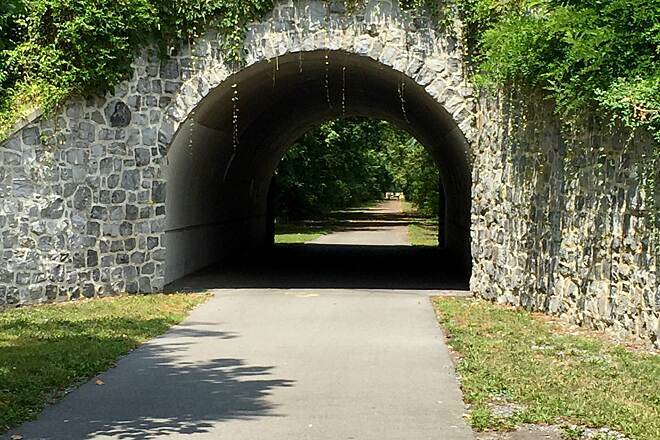 For my wife and me, this is our favorite rail trail in Maryland. It will be spectacular if and when it it is extended westward another 14 miles to cross the Potomac River six times on high bridges and pass through three tunnels. At the end of Gov. 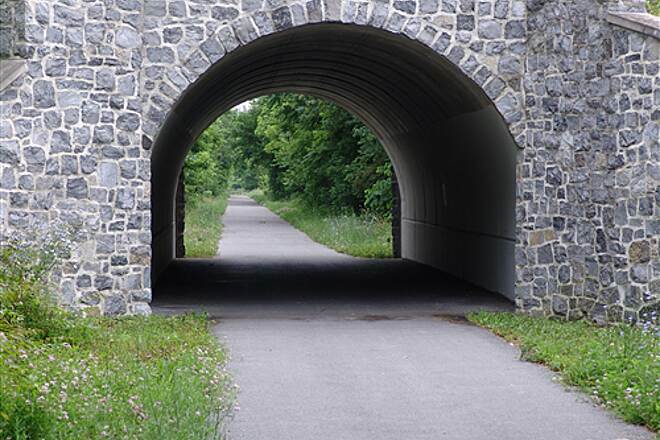 Ehrlich's term, funding was authorized to extend the trail through the first tunnel to Little Orleans but that seems to have been postponed indefinitely. 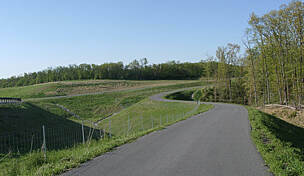 The WMRT has two main advantages over the parallel Chesapeake and Ohio Towpath: It is paved, not gravel and dirt, and it is located above the Potomac River floodline. 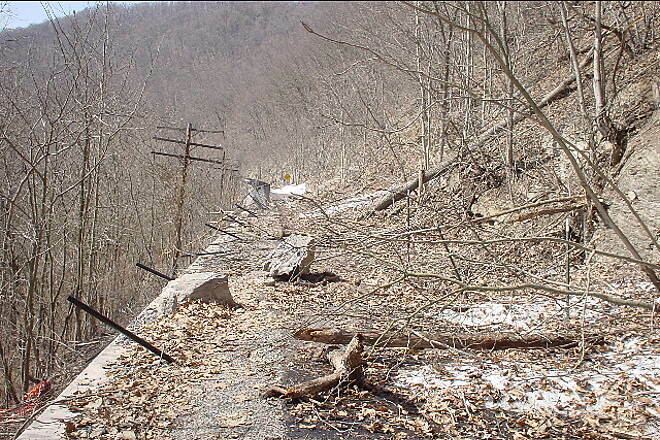 However, rockfalls have been a persistent problem, particularly on the section west of Hancock. Tiny slivers of slate from the rock cuts can and do puncture tires, so beware. Incidentally, the trail description given above confuses east and west: The Round Top Cement Mill is WEST on Handock, while Little Pool and Big Pool are to the east. My wife and I just spent two days riding the nearly every mile of the trail. We had a great time both days. Day one we started at the end nearest to Hagarstown and ride 7.5 miles out then back. Day two we started between mile marker 9 & 10 and rode to the western end and back. The people were all friendly and what a great trail. It is well maintained too. "We did the first 17 miles (and back) of this trail -notice should be given that for quite a few miles of this trail you are right next to interstate 70 - with all the noise, tractor trailers & pollution etc -that part is awful- it would be helpful to warn folks of this & I would reccommend cutting over to the C&O tow path to avoid the 'highway' part of the trail -- "
"I've been riding the Western Maryland trail over the years ever since they opened it, and I'd have to say this is one of the nicest trails in the area. 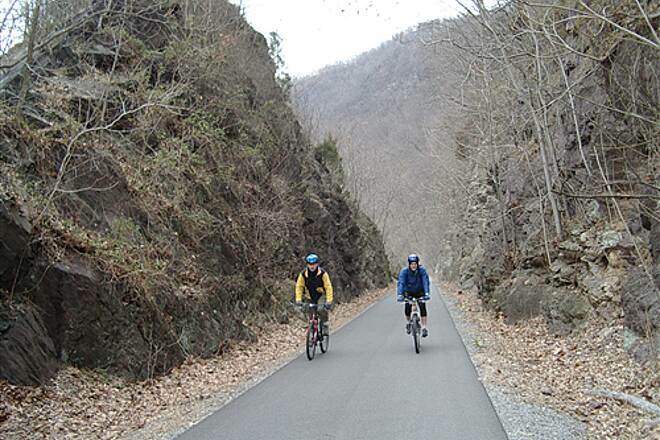 The surface is paved, which makes it similar to the W&OD Trail in Virginia and also the Allegheny River Trail in Pennsylvania. 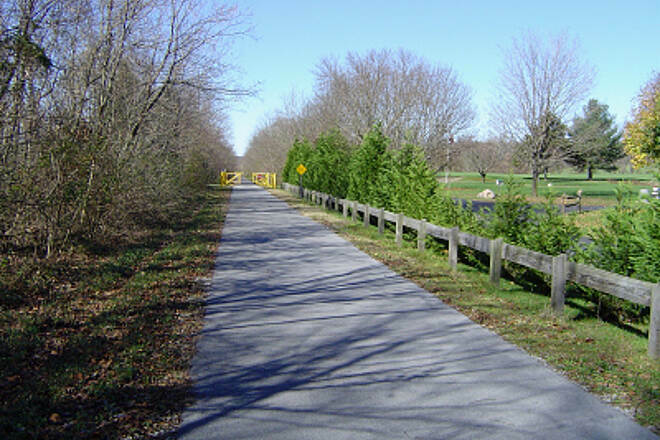 The paved surface makes for easy riding especially for beginners, it also means that you can use rollerblades on the trail, and there's no messy limestone/crushed rock dust to clean off your bike and legs like on conventional rails to trails. The trail is 22 miles long from it's Eastern trailhead near Big Pool down to it's Western end at Pearre. 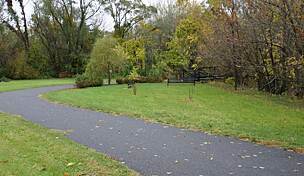 There are parking facilities at both trail ends as well as at the 10 mile mark in downtown Hancock, and there are portajohns at both ends of the trail. The trail runs parallel to the C&O canal, so it's easy to combine both trails into a ride if you want to ride a loop with 1/2 on the WMRT and 1/2 on the C&O. 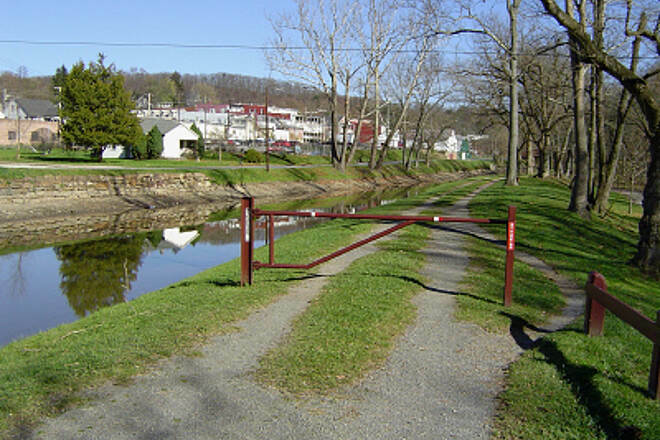 The easiest places to cross from one trail to the other are at the road crossing at about the 1 mile mark (C&O is just down the hill a few hundred yards to the South), at Little Pool, at Tonoloway Creek Aqueduct, in downtown Hancock, at Dam #6/Polly Pond, and at the trail's end in Pearre which ends right behind Lock 56 at mile 136.2 of the C&O Canal. The Westernmost trail end at Pearre is the most remote, and the easiest way to get to it is to take exit 77 off of Route 68, then follow Woodmont Road across the top of the ridge then down where it meets up with Pearre Road, turn right, then follow Pearre Road for about 2 miles until you see the trail parking lot on your left. The WMRT is the busiest on weekend mornings and afternoons, but it never gets really busy or crowded. You just have to pay attention to other riders when approaching them, and make sure you give a warning when passing...either by using a bell or yelling out ""Passing on the left"". Since it's paved the trail attracts alot of weekend/casual riders who sometimes don't follow the trail rules of keeping to the right, and sometimes ride 2-3 abreast across the trail....a painted dotted line down the center of the trail like on the W&OD Trail would probably help with this. The least used times of the trail are on weekdays and weekday evenings. The best time to see animals along the trail is in the early morning, or in the evening after 5-6PM. Sometimes in the evening the animals outnumber the trail users. I rode the 22 mile length of the trail on a Tuesday afternoon-evening 8/15/06, from around 3-7PM and saw more deer than bike riders. 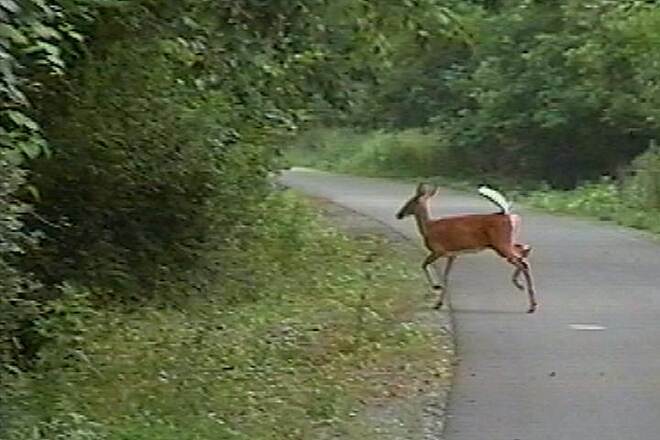 One deer at the 2 mile mark, 3 near the water at Polly Pond, and on the way back a garter snake and wild turkey near the 15 mile mark, one small doe near Mile 12/Locher Road, and four deer in the backyard of the white church about a mile West of Hancock. The most I've ever seen at one time was near the old abandonded houses near Mile 12, it was late in the evening and there must have been about 20-30 deer in the fields on both sides of the trail. 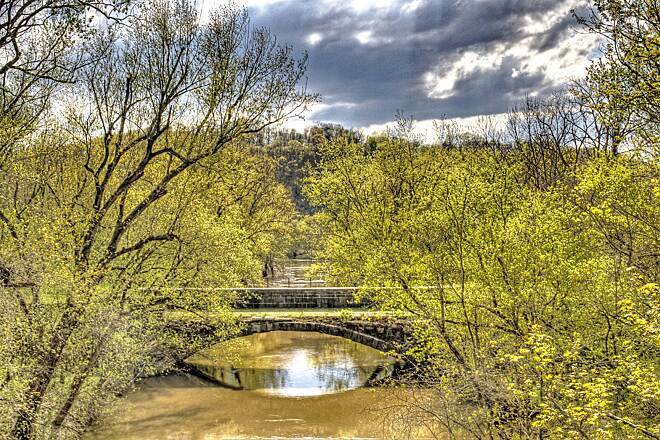 On the Eastern end of the trail at around the 1 mile mark you can cross from the trail down the road over to the C&O Canal and take the C&O East past Big Pool to Fort Frederick, a ride of about 2 miles. " "I've ridden on many rails to trails throughout the USA, but the WMRT became my favorite after I 'found' it, three days ago. 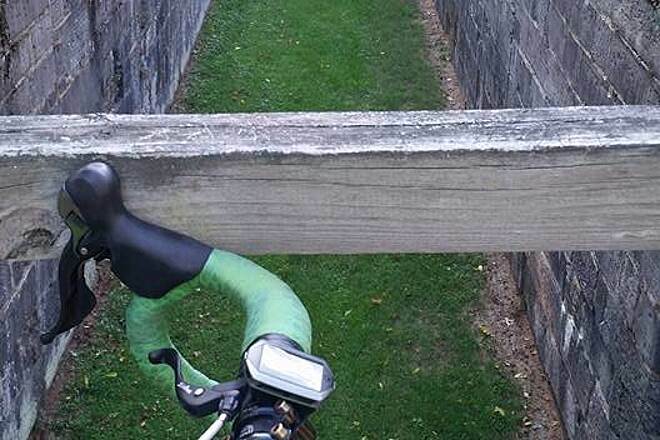 This is a true Maryland gem for all bike riders. It's especially well suited for road bikes. The paved surface is virtually without flaw. The grade is nearly flat the entire length (I had a very mild breeze to my back going upgrade, which actually made my average time a little faster than it was going downgrade), it is well shaded, and the quiet seems to be from another time and age. I took my ride on a perfect Monday morning and saw, maybe, twenty other riders on the entire 45 mile round-trip. 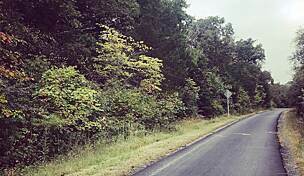 This truly is a beautiful trail and the people of Hancock and the surrounding areas must be very pleased with it." 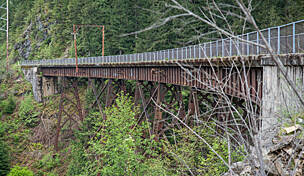 This was the first Rails to Trails that I have ever used. It was fantastic and I will do it again. Sights were great and even rode along side a family of white tailed deer that were running in the woods parallel to the path. At one point we both stopped and looked at each other. "What a gem, I wish I had this trail in my backyard I would be in great shape. This trail will leave you with a smile on your face. Check out cute little town of Hancock and C&O Bike Shop on right of trail. This parallels C&O for a short while and you can take a short side trip in Hancock to see one of the old locks on the C&O. Recommend this highly on a trail to do list." MY WIFE AND I RECENTLY RODE FROM CUMBERLAND MD. TO WILLIAMSPORT MD. (84.5 MILES)WHAT A JOY TO RUN ACROSS THE RAIL TRAIL JUST DOWNRIVER FROM LITTLE ORLEANS MD. 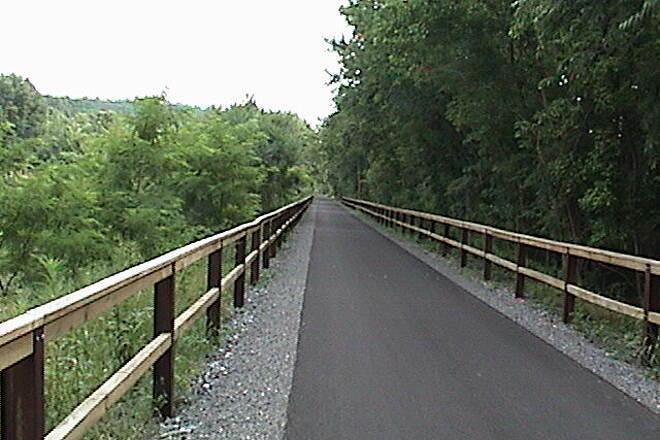 WOULD LOVE TO SEE THIS RAIL TRAIL EXTENDED. "I rode this trail (from Hancock west and back)on a hot morning after a big wind storm and was very impressed that there was a work crew already clearing fallen limbs and branches. The trail's website says it's not very shady, so I was hesitant to ride in the 90+ temps. But the trail is mostly shaded and the ride was very pleasant. " Polly Pond to Pearre now open. 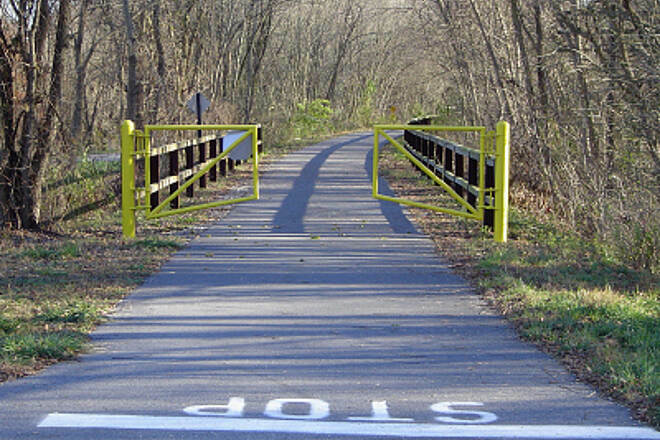 "The trail extension from Polly Pond west to Pearre is now open. 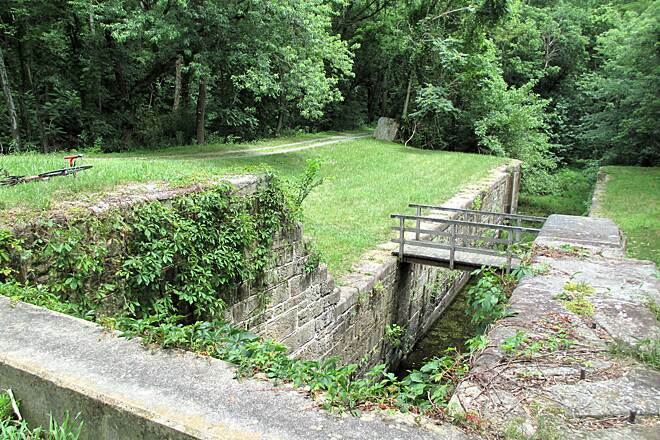 The trail now ends right at Lock 56 (mile 136.2) of the C&O Canal. There is a parking lot at Pearre for around 40 cars, and a couple of longer parking spots for trailers. There are also signs with descriptions and photos from the early 1900's showing Polly Pond, Woodmont schoolhouse, Woodmont Rod and Gun Club, and the Sideling Hill/Pearre Western Maryland Railroad terminal. Overall a very nice addition to the trail, only thing missing right now that would be nice to have is portajohns at the Pearre parking lot. 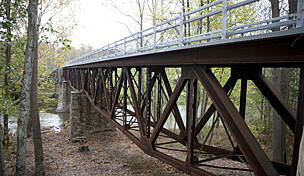 The Western Maryland trail is an excellent alternative route to the C&O Canal between Pearre and Fort Frederick, especially after heavy rains when the C&O becomes muddy. 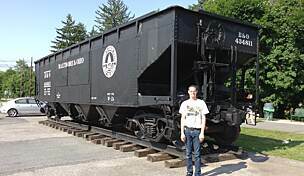 I hope some day that the Western Maryland trail will be extended further west from Pearre towards Paw Paw, like some groups have been discussing." 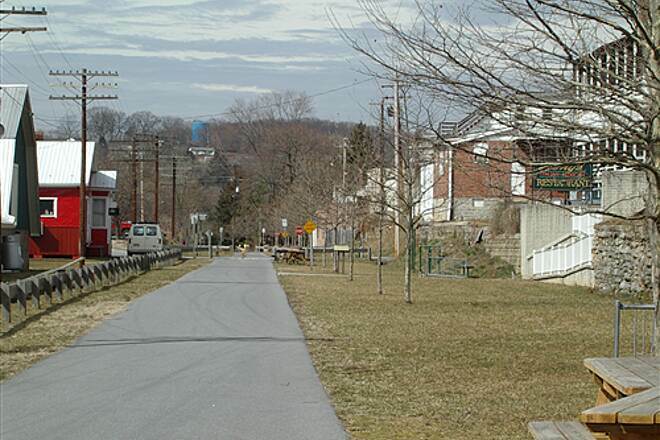 "Phase III of the Western Maryland Rail Trail, the 2.2 mile stretch heading west from Polly Pond, should be open for public use by early March 2005." 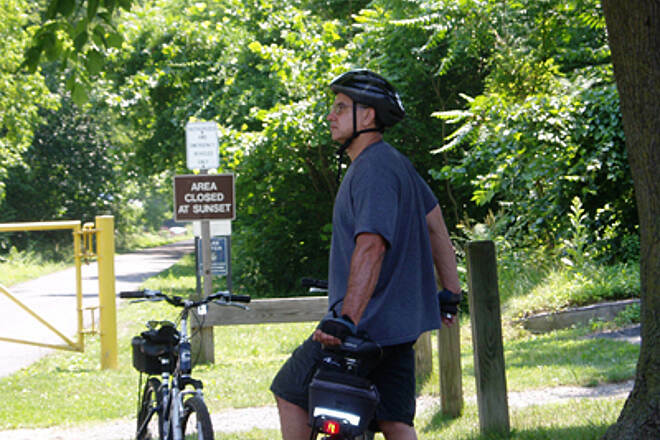 "The current 20 mile paved trail has received many outstanding reviews from riders all over the county. More and more bikers are arriving daily, including many repeat riders. The town of Hancock and the Chamber of Commerce are very active in seeing more improvements and an extension of the trail. As I write this on Sept. 10, 2004, the 3.2 mile extension with parking and turn-a-round is being consructed west of Poly Pond. Completion should be later this fall. 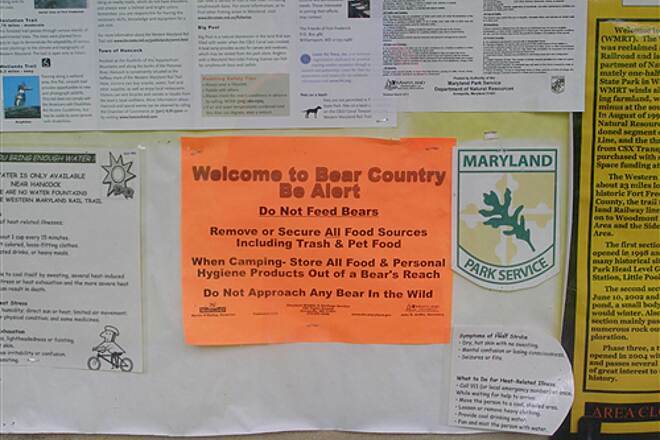 Several discussion meetings have been held with the Maryland Department of Planning, Department of Natural Resources and the National Park Service concerning the possible extension of the trail an additional 10 miles to North Branch. Further extension through West Virginia to Paw Paw has received unanimous support of the Morgan County West Virginia County Commissioners in August 2004. Completion of this portion of the trail will require much community and government support to be accomplished. 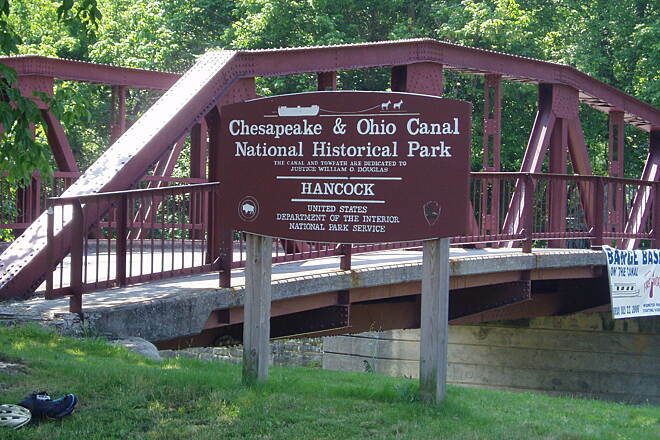 The town of Hancock is very fortunate to have such a wonderful recreational trail to complement to the existing C&O Canal Towpath. " The WMRT has been snow covered since 01-18-04 with no big melt in sight. State Park people should be thinking about plowing at least part of the trail. When spring comes don't miss this great trail.